Another Home Sold By Billi Gartman, Realtor of Anna Maria Life Real Estate 515 59th St. Holmes Beach, FL! Even though retirement is still a few years away, a couple from up North decided to buy their island retirement home now. Now they have plenty of time to design plan and renovate to make it their island dream home exactly how they want it to feel before they become permanent snowbirds! 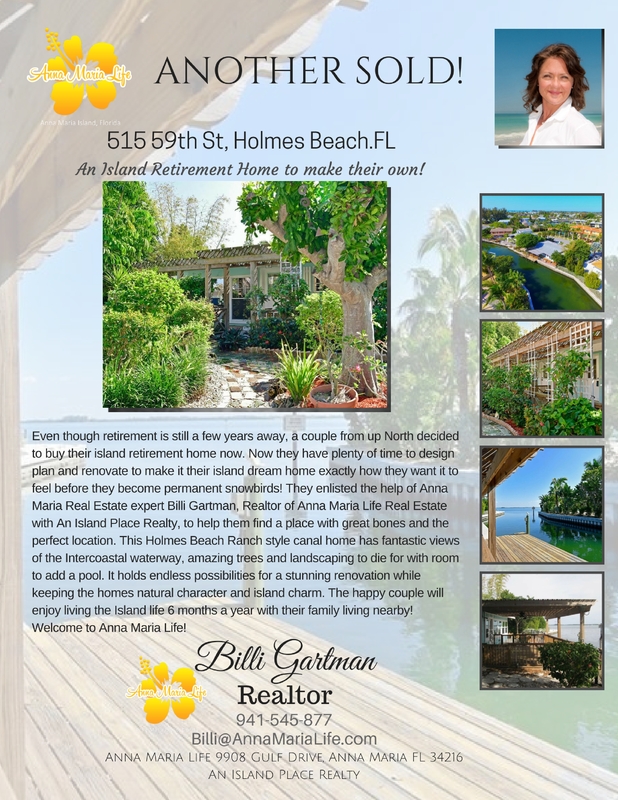 They enlisted the help of Anna Maria Real Estate expert Billi Gartman, Realtor of Anna Maria Life Real Estate with An Island Place Realty, to help them find a place with great bones and the perfect location. This Holmes Beach Ranch style canal home has fantastic views of the Intercoastal waterway, amazing trees and landscaping to die for with room to add a pool. It holds endless possibilities for a stunning renovation while keeping the homes natural character and island charm. The happy couple will enjoy living the Island life 6 months a year with their family living nearby! Welcome to Anna Maria Life!